(CNS): Fears that Cayman passports would lose their unique identity have been alleviated, the premier has stated, following discussions with the UK’s passport officials. Following announcements that the British were repatriating the production and issuance of its overseas territories' passports to make them bio-metric, concerns were raised that the OT passports would no longer identify the territory the holders came from. 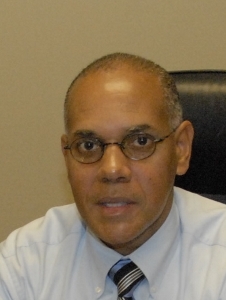 However, Alden McLaughlin said he was given assurances that those issued to Cayman Islands residents would continue to bear the country’s name. “They will be bespoke passports, meaning the country’s name will still be on the front cover,” McLaughlin said. “I feel a bit more comfortable about that,” he added, after he had been particularly concerned about the implications of what many saw as a retrograde step in Cayman’s move towards more autonomy and the modernisation of its relationship with the UK. The Cayman Islands authorities will also retain control of passport applications and distribution and the ability to produce emergency passports locally. The country has about two years’ of stock for emergency passports. Once the UK begins printing OT passports, Cayman passport applicants will enter their information here and it will be transmitted to the UK using secure technology. The passports will then be printed in the UK and returned to the Cayman Islands Passport Office where they will be distributed. Last year the UK set a deadline of December 2014 for the repatriation of passport printing for all overseas territories. The UK-printed passports will be biometric. Passports issued in the Cayman Islands do not have the biometric features. (CNS): Although the smoke coming from the George Town dump caused some minor discomfort to people around the airport for a couple of hours today, officials from the Cayman Islands Airports Authority (CIAA) confirmed that flight operations were not affected. Although there was reduced visibility, flights took off and landed as normal. The afternoon rain helped to minimize the smoke that was billowing towards the airport area and as a preventative measure the CIAA used ventilation fans to enhance the circulation of air in the check-in concourse. They also closed some of the doors in an effort to prevent smoke from entering that area. Facial masks were made available to airport staff but inspections of the terminal and consultation with airport partners led to the determination by the airport authority that with only a faint smell of smoke it was not unbearable for employees or passengers. However, the CIAA said it would continue to closely monitor the situation in consultation with the Fire Service. Meanwhile, CUC closed its doors to customers at the North Sound offices as a result of the massive amount of smoke around the industrial area and the Water Authority closed early. The Cayman international School, which is located very close to the landfill, was closed from this morning and Hope Academy at Grand Harbour also closed as a result of the shifting winds that began driving smoke east. The fire service has confirmed it could still be a few more days before the fire is completely extinguished but it is now contained and controlled by fire crews. (CNS): The executive sous chef at a local restaurant in Camana Bay has been found guilty of wounding after he broke a man’s jaw during a brawl at a gas station on the West Bay Road last year. Visiting judge Justice Malcolm Swift found that Michael Joseph Fischetti had punched Edenis Miguel Rives hard enough to knock him out and break his jaw, even though the man was trying to get away. Fischetti was convicted following a three day judge-alone trial before Justice Swift last week in connection with the incident, which took place in the early hours of 16 March last year, when the jealous chef over-reacted after he saw his girlfriend embrace male friends at the gas station in greeting. The judge described the meeting, which was seen by the court on the gas station’s CCTV footage, as “quite harmless and normal” but Fischetti, who was waiting outside in a taxi for his girlfriend, didn’t see it that way and told the police after his arrest that the man was “grabbing on my girlfriend”. The judge said the defendant completely misread the situation and was provoked into a jealous reaction. He quickly made his way inside, where he confronted the man he was later to punch so hard he broke his jaw. “I am completely satisfied that Mr Fischetti brought this whole unhappy situation about andwas entirely responsible for causing the brawl which ensued,” the judge said in his verdict. The men all began arguing in the gas station as Fischetti was said by witnesses to have hurled allegations at the two men who had greeted his girlfriend and threatened to kill them. This triggered a fight as the complainant’s cousin punched the chef; the men and others around them piled outside the gas station store, while the melee continued both in front of and away from TV cameras, with the men throwing punches. At some point, however, the CCTV records Rives backing away from Fischetti, as the chef ran across the forecourt towards him. The fight continued out of the view of the CCTV but according to witnesses Fischetti pursued the complainant and finally caught up with him to land the critical blow, which is said to have knocked Rives out cold and broken his jaw. Although Fishcetti had claimed self-defence during his police interview, he did not give evidence from the dock, relying on the account he gave after his arrest that he had been punched by people in the fight and he was hitting out at anyone to defend himself. “I saw the defendant on the CCTV chasing a retreating complainant. He was in hot pursuit,” the judge said. “I am satisfied that by this time the defendant had lost his self-control and was intending to hit the complainant,” he added as he delivered his guilty verdict. 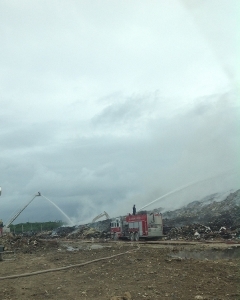 (CNS): A switch in the wind direction and a little welcome rain all helped in the battle of the dump fire Thursday morning, when crews were able to work upwind of the smoke coming off the fire, which continues to blaze deep under the surface of Mount Trashmore. Weather conditions were in the fire fighters' favour and after battling throughout the night to keep the dump saturated, crews were able to control the blaze. Acting fire chief Rosworth McLaughlin explained that his men would spend Thursday attempting to penetrate beneath the surface and dampen the internal blaze. The crews are working in tandem with the Department of Environmental Health (DEH) to turn the rubbish and saturate deep inside the mountain of garbage. Although the chief fire officer expected it would still take a few days to put the fire out, he was confident that with the prevailing winds his men would be able to tackle the fire much more safely and therefore contain the internal blaze until they could extinguish it. Having tapped into wells at the site, the fire fighters have a water source, and withmore than 20 men on site at Mount Trashmore round the clock and some ten pieces of equipment, the fire service is using all available resources. With the smoke blowing away from George Town east across the North Sound, the picture from the deck of the five cruise ships in port Thursday was a significant improvement on the image of Cayman left on the mind’s eye of some 14,000 visitors on Wednesday. Nevertheless, the fire serves as a stark reminder to government that it must act more quickly in its efforts to deal with the current dump and the future of waste-management on Grand Cayman as well as the Sister Islands. Minister Osbourne Bodden has made it clear that it will be two years before a full waste-management programme is in place because government’s hands are tied by the Framework for Fiscal Responsibility agreement with the UK. However, Bodden is committed to finding the money to repair and replace excavators and other essential equipment at the dump so that the team there can better manage the landfill. As a result of budget cuts, there has been no money for aggregate to mix in with the garbage to help compact and seal it in, making it more vulnerable to ignition and fires as intense as the one still burning. In addition, the equipment owned by the DEH is old and in need of repair and replacement, all of which has been hindering the staff’s ability to manage the tons of waste coming on to the site each day. Earlier this morning Cayman international School was closed to students and CUC also closed its North Sound office due to the thick smoke that continued to come from the dump throughout the day. A statement from government officials at 2pm said there was no imminent threat to any buildings or homes and the fire was well away from where the tyres are kept, which were not at risk of igniting. The government confirmed that fire crews will stay on site on a shift basis until the fire is totally extinguished, which is likely to take a few more days. 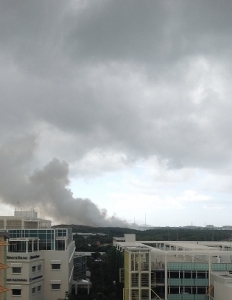 (CNS): The Cayman International School closed its doors to students today as winds drove the smoke from the still blazing George Town dump fire across the school campus and towards Camana Bay. Fire officers were still battling the blaze on Thursday morning, more than 24 hours after a fire started deep inside Grand Cayman’s landfill yesterday. Despite their best efforts, firefighters have still only managed to contain about 50% of the internal blaze, which keeps re-igniting across the main areas of mount Trashmore. All off duty personnel have been called into work to maintain the round the clock fire-fight. The general public is advised to avoid the area as much as possible as a result of the thick smoke billowing from the ongoing blaze. Officials said that further updates would be forthcoming during the day as crews try to get better control of the internal blaze. Check back for updates later today.